(Courtesy the Utah Division of State Parks) A woman shows where a dinosaur track is imprinted into the red sandstone at Red F... (Courtesy the Utah Division of State Parks) A woman shows where a dinosaur track is imprinted into the red sandstone at Red F... (Photo courtesy of Utah State Parks) Red Fleet State Park (Courtesy Utah Division of State Parks) Pictured are dinosaur tracks at Red Fleet State Park near Vernal, Utah. (Courtesy Utah Division of State Parks) Pictured are dinosaur tracks at Red Fleet State Park near Vernal, Utah. (Courtesy Utah Division of State Parks) Pictured are dinosaur tracks at Red Fleet State Park near Vernal, Utah. (Courtesy Utah Division of State Parks) Pictured are dinosaur tracks at Red Fleet State Park near Vernal, Utah. (Courtesy the Utah Division of State Parks) A woman shows where a dinosaur track is imprinted into the red sandstone at Red Fleet State Park near Vernal, Utah. (Courtesy the Utah Division of State Parks) A woman shows where a dinosaur track is imprinted into the red sandstone at Red Fleet State Park near Vernal, Utah. 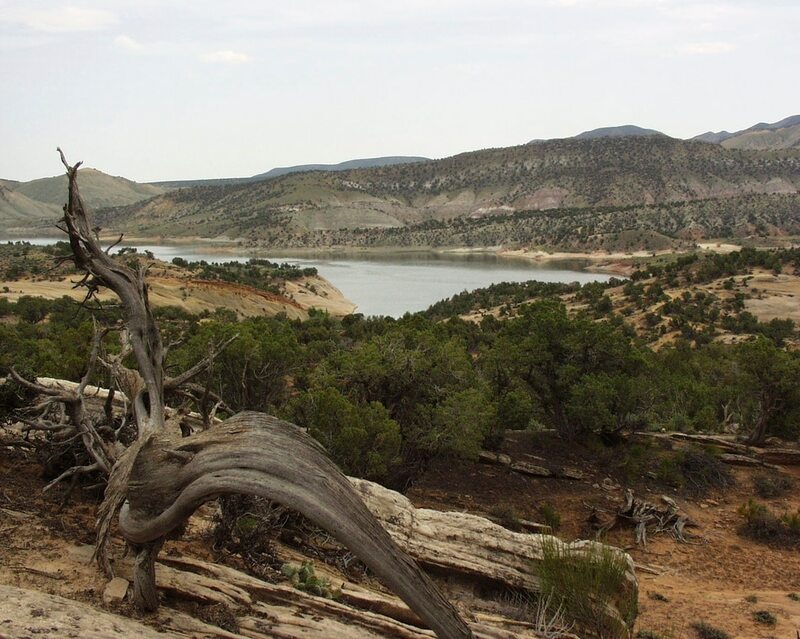 (Photo courtesy of Utah State Parks) Red Fleet State Park (Courtesy Utah Division of State Parks) Pictured are dinosaur tracks at Red Fleet State Park near Vernal, Utah. (Courtesy Utah Division of State Parks) Pictured are dinosaur tracks at Red Fleet State Park near Vernal, Utah. (Courtesy Utah Division of State Parks) Pictured are dinosaur tracks at Red Fleet State Park near Vernal, Utah. (Courtesy Utah Division of State Parks) Pictured are dinosaur tracks at Red Fleet State Park near Vernal, Utah. As Josh Hansen untied his patrol boat, he could hear the splashes. He wasn’t sure how many there were before he got to the dock, but at least two heavy thunks sounded off the water while he started the engine. About 500 yards away and a few minutes’ distance from where he was, someone was throwing heavy slabs of stone over a cliff and into the reservoir below. Hansen raced for the opposite shoreline. When he pulled in, a kid was about to toss another rock but paused. 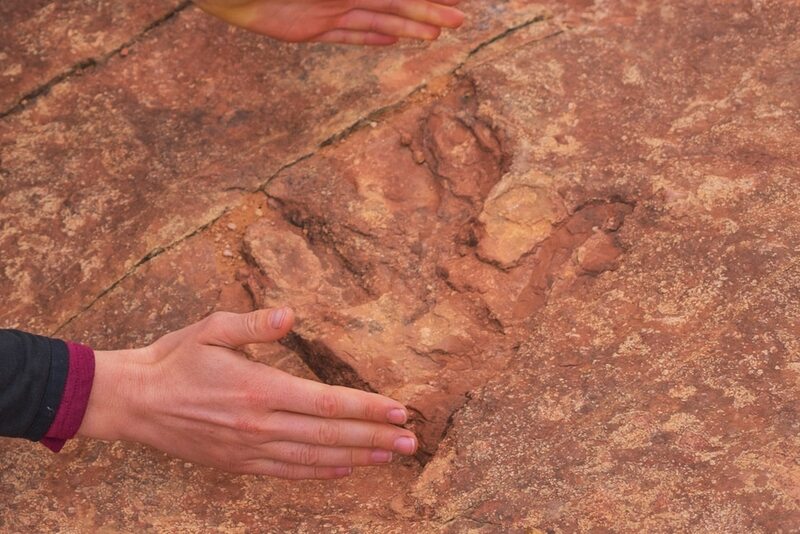 On the surface of the dusty red sandstone that he was holding were two toe imprints from a partial dinosaur track. Some 200 million years ago, 8-foot-tall carnivorous dinosaurs trudged though the terrain in what is now northeastern Utah. The footprints they left behind are the basis for Red Fleet State Park about 10 miles outside Vernal. A trail runs past hundreds of the prehistoric raptor tracks stretching up a slickrock slope. And thousands of people come each year to see them. Over the past six months, though, the site has been heavily vandalized. Visitors — much like the kid Hansen stopped two weeks ago — have been chipping out pieces of rock and hurling them into the the water. Some of the sheets sink to the bottom of Red Fleet Reservoir, some shatter upon hitting the surface, some dissolve entirely. “Some of them are likely lost forever,” Chavez said. Red Fleet State Park is considering sending a diving team to recover what it can from the lakebed. But, for now, it’s putting up more signs asking tourists not to touch the sandstone. “You’d think common sense would provide guidance, but it’s not coming across in people’s mind,” said Hansen, who’s been the park’s manager since March. He’s responded to two cases in the past two weeks. This area, which is now a dry and dusty desert, was once a bog filled with mud and moss. Paleontologists believe the dilophosaurus, part of the raptor family, would ambush other dinosaurs while they were resting or getting a drink in the swamp. They were fast with sharp teeth and toes used as weapons. Some weighed as much as a small horse. “We’re going to be cracking down on it a lot more,” Chavez said. Many of the tracks are noticeable walking through the landscape. But plenty are not. At least 10 of the larger, more visible footprints, which range from 3 to 17 inches, disappeared in the past six months. Chavez said that’s a conservative estimate. Similar vandalism and graffiti are happening throughout the state. Tourists are carving their names into redrock arches. Some are spray-painting canyon walls. And it’s frustrating land managers and park rangers. Last year, 37,000 people came to Red Fleet State Park. From the dock, Hansen can see as visitors climb up the hill toward the dinosaur tracks and now, when he does maintenance work nearby, he listens for any splashing.